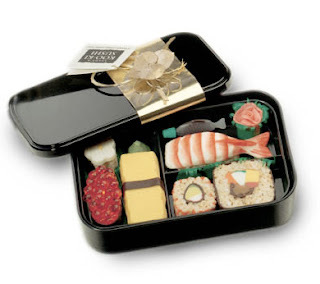 This bento box isn't sushi and sashimi at all. The ladies at Suedy's Koo-ki Sushi are iron chef's at whipping up dark chocolate seaweed, white chocolate sashimi, lemon merengue tamago and apricot flavored gummi roe. I saw this on the food network, it looks like a good gift item. That's it. That was made for yours truly.